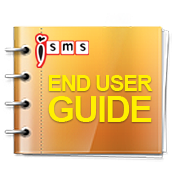 iSMS Malaysia - Online SMS Marketing End User Guide Compose SMS. Lowest price & most reliable Bulk SMS marketing tool. 2 way sms Malaysia, Bulk SMS, bulk sms Malaysia, bulk sms Singapore, online sms solution, web sms marketing. 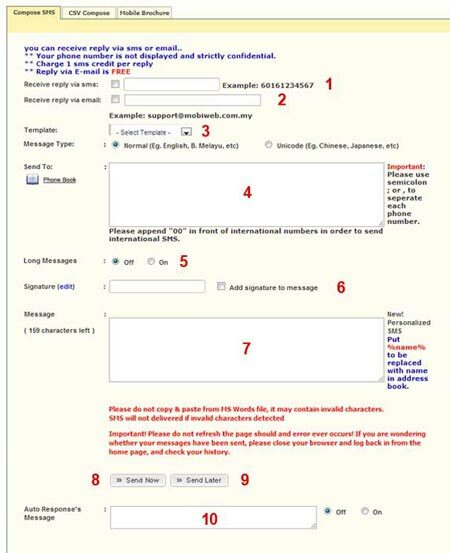 Go to the "SMS" tab menu and select "Compose SMS"
Template - Select Template to send SMS. Enter your destination number to send. Separate each mobile number using semicolon. Long Message - If you wish to send long message. Message Type - key in your message there and iSMS system will auto calculate the characters remaining for you. for Normal message type, maximum 153 characters per SMS credit. for Unicode message type, maximum 63 characters per SMS credit. Click Send Now to send SMS. Click Send Later for task scheduler. Auto Response Message - auto reply after receive SMS from customer.